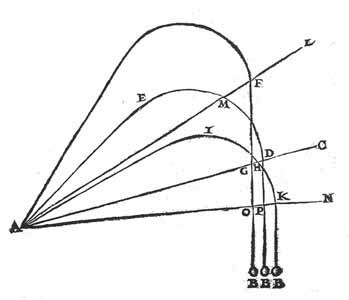 It is Albert of Saxony’s scientific conception of the trajectory of a canon ball, based on different angles of firing. Albert of Saxony (14th century) amended Ibn-Sina’s theory by introducing a transition phase. In the firing of a cannon, he believed, there is a first phase when the impetus provided by the cannon is greater than the weight of the cannon ball; so the ball moves in a straight line. During the second phase, as the initial impetus reduces the downward force has an increasing influence on the object, causing the object to fall below its original path. In the third phase, the impetus is spent and the cannon ball falls straight down. It is interesting to note how the paths drawn bare no resemblance to what is seen, which is a parabolic curve. It was not until Galileo Galilei had his conception of motion being considered as having two components, that motion was finally drawn in a manner consistent with the actual reality. The lesson here is that often scientists are driven by what they consider should happen, and not what actually happens. We can laugh at such great misconceptions, but for me it is interesting to consider why people were so far from the truth. For it seems to me that while we may laugh at such things, we often to fail to notice that we too, in the 21st century, could possibly be making the same category of errors. I just wonder what our future generations will say about our linearity of thinking. I just wonder if they will laugh and be astounded at our inability to understand the dynamics of nature, and that systems have limits. 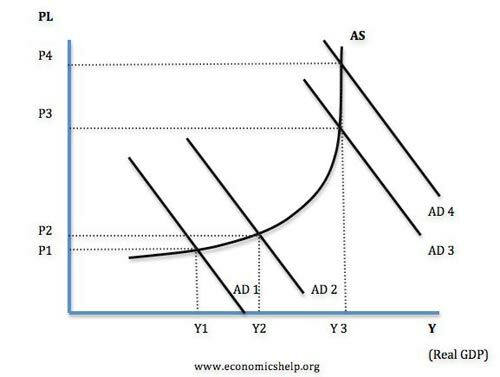 For in economics today, when we look at trajectories of growth, for the most part we fail to notice that growth has limits in a finite world. The word limit is taboo for politicians, and all that they are able to conceive of is a world with infinite growth, where growth is the number one goal. This is a very short and simple blog posting, but it does raise a serious point. Of course economists ask themselve if there are limits to economic growth, and the British government is now recognising that there is more to growth than just GDP, and it is beginning to measure happiness of people as well. And it is a new year and this coalition government has one over-riding resolution, and that is to help drive growth and create jobs right across our country. And today I want to argue that there are three essential parts to our plan. One: you’ve got to have proposals for restoring the health of the public finances. Two: you’ve got to have a strategy for growth. And three: you’ve got to make sure that growth is balanced and spread more fairly across our country. And I want to take each of those in turn. Academic ability is no guarantee of being dead wrong. I think we may just have found some modern trajectories?